Continuing with the soup du jour theme, I wanted to share another of my Dad’s favorites: Lentil Florentine. Lentil soup was a staple in my house growing up and it was often featured on the Lista’s menu. Lentil Florentine is really an Americanized name for Zuppa con Lenticchie e Spinaci or soup with lentils and spinach. In culinary terms, “a la florentine” (in the style of Florence) generally means something is served on a bed of spinach or topped with spinach. So, as was characteristic of Lista’s menu lingo, the lentil soup with spinach was called Lentil Florentine. Lentils have been cultivated and eaten for thousands of years. They are a high protein, high fiber member of the legume family. And lentils are an important part of the diet in many South Asian, West Asian, and Mediterranean cultures. Lentils come in many colors and sizes but the most common are brown, green, and red. Interestingly, the world’s largest lentil producer/exporter is Saskatchewan, Canada. In Italy lentils (lenticchie) are often served as a side dish with meats and fish. Lentils are commonly paired with pork (pancetta, speck, contechino, or fennel sausage) and cooked with rice or pasta. And, of course, there are several soup variations: Zuppa di Lenticchie, Minestra di Lenticchie, Riso e Lenticchie, Pasta e Lenticchie… and so on. Notes: I still make this soup often. When I make it at home, I will sometimes start with chopped mild Italian sausage (casing removed) and then cook the vegetables in the sausage drippings which adds another layer of flavor to this delicious soup. I have also used up leftover diced ham by adding it at the end of the cooking time until heated through. Many times I add cooked brown rice or small pasta like ditalini just before serving. 1. In a large soup pot, heat oil over medium heat. Add onions, carrots, and celery; cook and stir until onion is tender. Stir in garlic, bay leaf, salt and pepper; cook for 2 minutes. 2. Stir in lentils, add broth and bring to a boil. Reduce heat, and simmer for 30 minutes. 3. Squeeze water from thawed spinach and add spinach to pot along with tomatoes. Stir thoroughly and continue to cook until lentils are tender about 30 more minutes. Remove bay leaf and adjust seasoning to taste. 4. When ready to serve ladle into serving bowls and top with a generous amount of Pecorino Romano. There you have it, Vinnie’s Lentil Florentine just like we served at Lista’s. This hearty soup is rich and very satisfying on a cool fall evening. Serve it with some crusty bread and a crisp green salad for a quick and healthy weekday meal. Leftovers are great for lunch the next day, and can be frozen in microwaveable containers for up to a month. Lista’s Italian Cuisine had many memorable items on their menu. Most customers had their personal favorites, whether it was Spaghetti with Meatballs, Lasagna Bolognese, Eggplant Parmigiana, or the fabulous Rigatoni fra Diavalo — everything was well crafted, satisfying and delicious! Still, there was one unsung hero on the menu that truly showed my Dad’s culinary passion: the soup du jour. Dad was a soup connoisseur… and a Soup Master. He personally created and prepared a variety of soups that had a perfect balance of broth, substance, texture and most importantly flavor. And whenever Dad dined in another restaurant he always ordered soup. Partly to see what the competition was doing, but primarily because he simply loved a good bowl of soup. If the soup was good, Dad was sure to compliment the chef — but if it was not so good, he wasn’t afraid to comment on that. One soup lesson I remember Dad teaching me when I worked at Lista’s: You need to always serve soup from the bottom of the pot, in other words, don’t just scoop the broth off the top but reach the ladle down and bring up all the ingredients so each customer would have a full bowl of soup goodness. And this was a lesson he freely shared with the waitstaff in other establishments whenever he ordered soup. One of the notable members of Dad’s soup repertoire was Lista’s Minestrone. Minestrone (pronounced “min eh stron ee”) is the quintessential Italian vegetable soup and its name literally means “soup” so to say minestrone soup is truly redundant. Lista’s served minestrone every day… and for many years served it as a complimentary appetizer with every meal. In a busy restaurant, chef’s often turn to certain specialty or convenience food items to make prep time shorter, and such is the case with Lista’s. To make his minestrone Dad always used a frozen “Italian Vegetable Blend” with zuchini, cauliflower, carrots, Italian green beans, and red peppers. And since the soup was made almost daily the use of frozen vegetables didn’t detract from the fresh taste or texture. The soup also included ditalini pasta, ceci beans (garbanzo), and of course a generous amount of Pecorino Romano cheese. And although minestrone is a vegetable soup it was always made with chicken stock (in those days vegans weren’t a big demographic). Chicken stock was generally the basis for all soups with the exception of those with beef in the name (i.e beef barley). You can easily use one of the many boxed chicken broths/stocks available today (or substitute a vegetable broth) or even use a jar of chicken base — but for an authentic soup making experience making your own homemade chicken stock is quite simple. Here is my method of making homemade chicken stock. I have found using inexpensive bone-in, skin-on chicken thighs works well but chicken quarters, drumsticks, or even the whole bird is equally good. And if I have 1 or 2 leftover rotisserie chicken carcasses in the freezer I add those. I typically only add bay leaf but will throw in a sprig of thyme or parsley if I have it around. Sometimes I add some ground turmeric (good antioxidant) which gives the stock a rich yellow color that is especially nice when making rice with the stock. And unlike packaged products, this stock is free of sugars, yeasts, MSG, soy, gluten/wheat, mushrooms, and tons of salt. It takes some time but is well worth it from a healthy eating perspective. 1. You will need a large stock pot or dutch oven that has a lid. Place pot on the stove and turn the burner on med-high. Season the chicken thighs with salt and pepper and place skin side down on bottom of heated pot. Allow to sear and cook for 10 minutes, turn over so skin side is up. Add broken up chicken carcasses if using. 2. Add celery, carrots, onion, garlic, peppercorns, bay leaves, and thyme (if using), salt and turmeric (if using) — cover pot and allow to sweat for 10 minutes. Add 10 cups cold water and bring to a boil. Reduce heat to low, cover pot and allow to simmer for at least 1 hour. Occasionally skim off any foam that accumulates at top (if desired). 3. When done cooking, use tongs to remove the chicken pieces (reserve meat for the soup or another use). Remove and discard the vegetables and bones — then strain stock through a wire mesh strainer into a suitable container. Discard anything left in strainer. 4. If using right away to make soup, allow the stock to sit for 15 minutes and use a kitchen spoon to skim accumulated fat from the top — or if using later pour into small containers (about 2-3 cups) and refrigerate overnight allowing the fat to solidify on top. Then simply remove and discard fat before using in recipes. 5. This homemade chicken stock, if properly cooled, will last 3-5 days in the refrigerator or can be frozen up to a month. 1. Heat the olive oil in a large heavy stock pot over medium heat. Add celery, onions and garlic and cook, stirring occasionally, until onions are translucent. 2. Add chicken stock to pot, turn heat to high and bring to a boil. Add frozen vegetables, garbanzo beans, canned tomatoes, parsley, basil, salt and pepper. Return to a boil — reduce heat to med-low and allow to simmer until vegetables are cooked through — about 15-20 minutes. 3. In a separate small pan, cook pasta according to package directions to al dente. Drain and rinse with cold water. Set aside. 4. Just before serving, stir pasta to soup and allow to heat through — about 5 minutes. Stir in 1/2 cup Pecorino Romano and ladle soup into individual bowls. Serve immediately. There you have it, a good basic chicken stock and Lista’s Minestrone just like Dad made in the restaurant. If you can’t find the Italian Blend Vegetables (Wegmans, Tops, Walmart and Target all have a version) then feel free to use equivalent amounts of fresh vegetables. The flat Italian green beans and cauliflower are a nice touch so you have that green-white-red Italian flag look. If you won’t finish the soup in one sitting then keep the pasta on the side and add it to the individual bowls when serving (to avoid pasta getting mushy). You can freeze the leftovers (without pasta) for up to a month in a sealed container. Pasta comes in many shapes and sizes, an almost unlimited variety… yet many people only enjoy a few of those varieties, sticking to the familiar or maybe some favorites. When I was growing up, the pasta we ate was either spaghetti, rigatoni or elbows, with an occasional foray into fettuccine (only with Alfredo); rotini (tri-color for pasta salad) or gnocchi (which I only ate at Lista’s). And there were a few cheese filled pastas like ravioli or manicotti which were also featured on the Lista’s menu. But generally, in our house, the pasta repertoire was relatively limited. In the 70’s I became aware that ziti was kind of a “thing” and lots of people were making baked ziti dishes for family gatherings and potluck suppers… and it was forever seen on any wedding buffet in the Rochester area. Ziti by itself is somewhat lackluster — smooth and hollow — the dull nephew in the pasta family. I always thought of it as a poor substitute for the more robust rigatoni I was used to. Ziti was always at its best when pared with a savory sauce, and the richness of meat or cheese. So for many the popular Baked Ziti combination of pasta and meat sauce topped with mozzarella was the prevalent choice. At some point, my Dad started cooking a “new” ziti dish made with broccoli, olive oil and garlic, which was a real departure from our typical fare of red sauce, meat, and mozzarella… and using luxurious olive oil and aromatic garlic made the dish more exotic and romantic than the standard stuff. This simple dish soon became one of Dad’s personal favorites and he made it regularly at home; and when “vegetarian” menu options became necessary in the late 70’s (thanks to Mollie Katzen and Moosewood) the dish was often served at Lista’s. Even though Dad’s recipe only has a few ingredients; is pretty unsophisticated, and easy to prepare — it is still a tasty and satisfying meal. 1. In a large pot of salted water, cook pasta per package instructions until “al dente” about 8 minutes. Reserve 1 cup cooking water. Drain pasta in colander and set aside. 2. In a large saute pan, heat the olive oil, garlic, and pepper flakes over medium heat until fragrant. 3. Add the broccoli florets to the pan. Toss the broccoli to coat with the oil. Season with salt and pepper and saute over medium heat until the broccoli is crisp-tender, about 5 minutes. 4. Turn the heat up to med-high and deglaze the pan with the cooking water or broth, stirring up any browned bits. 5. Add in the cooked pasta and gently toss until everything is heated through. 6. Spoon into plates or pasta bowls and top with a generous amount of grated Pecorino Romano cheese before serving. There you have it, Vinnie Lista’s Ziti & Broccoli. This is a super simple but really delicious meatless meal for your family, and a nice change of pace from a red sauce. It is easy to double or triple the recipe for a large gathering. For a more upscale dish add some sliced mushrooms and red bell pepper with the broccoli and use some white wine to deglaze the pan. If you prefer something with more substance try adding sliced cooked chicken breast or cooked shrimp when you add the pasta. I hope you enjoy it. 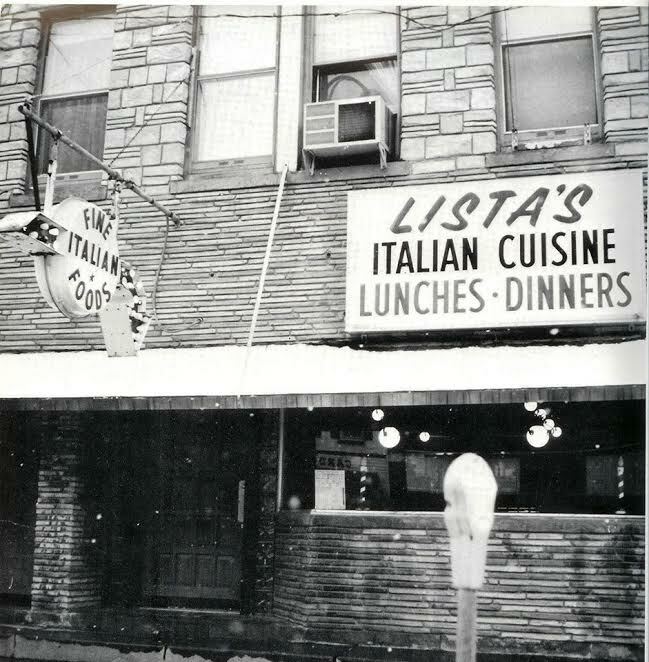 In my time, Lista’s Italian Cuisine stood at 74 Main Street and served primarily Italian foods, however, in its earlier years (1940’s & 50’s) the place was called The Campus Restaurant & Soda Bar and my grandparents were catering to the local “college town” clientele with typically American foods like sandwiches, char-broiled burgers, and ice cream sodas. Then, as the story goes, after my Dad returned from serving in Korea, whenever some of the servicemen would come into the restaurant they would say to Grandma, “Hey Ma, make us some spaghetti” or “make us some lasagna” and the idea of serving Italian specialties took off. Still even at Lista’s Italian Cuisine some of the traditional American favorites remained on the menu: Grilled Steaks, Baked Ham, Fried Chicken, and of course Meatloaf! Yet, the meatloaf on the Lista’s menu was not typically “American” in that it was never topped with ketchup or served with brown gravy and mashed potatoes. Lista’s meatloaf didn’t contain veal, pork, sausage or bacon; no extra veggies or cheese. Instead it was an unpretentious combination of ground beef, onions, eggs, breadcrumbs and rolled oats (a nod to the leaner days of the Depression and my Dad’s time in the Army) and baked au naturel. The result; a dense, firm meatloaf — moist enough that it could be sliced very thin without crumbling. On the menu, the meatloaf was featured topped with sauteed green peppers and served with a side of spaghetti or fried potatoes. So here is the recipe for the restaurant style meatloaf that I grew up with. Give it a try as written… or you could certainly use a beef/veal/pork meatloaf mix if you prefer; add some diced green peppers or other veggie (if you want to hide them from the kids). Feel free to adjust the seasoning to your particular taste — bake it in a bread pan and even top it with ketchup if you must. A note to my GLUTEN FREE friends… use GF rolled oats and bread crumbs — or substitute an equal amount of cooked quinoa instead. 1. Preheat oven to 375 degrees F with rack in the middle. Prepare a rimmed baking pan with foil or parchment and spray with cooking spray. 2. In a large bowl add all the ingredients listed and knead together with clean hands (or use disposable gloves) until thoroughly combined and no dry ingredients are left in clumps. 3. Gather up all the meatloaf mixture in your two hands and roughly form it into a football shape. Place in center of prepared baking sheet and continue to press and form the meat into a loaf shape approximately 5 inches wide by 9 inches long. 4. Place meatloaf in the preheated oven and bake for 60 minutes until cooked all the way through and/or an instant read thermometer reads at least 165 degrees in the center. 5. Remove from oven and let rest for 10 minutes before slicing and serving with your favorite side dishes. There you have it, the Lista’s Restaurant version of meatloaf. Leftovers freeze well and can be reheated in the microwave without losing texture. Sliced thin it makes great sandwiches (I like mine on toast with mayo and sliced tomato).